The last major conflicts east of the Mississippi River, involved the Seminoles . The Seminoles were the dominate tribe in the area that we now call Florida. There were two Seminole Wars. The first one was a series of skirmishes that occurred while this area was still under Spanish control. 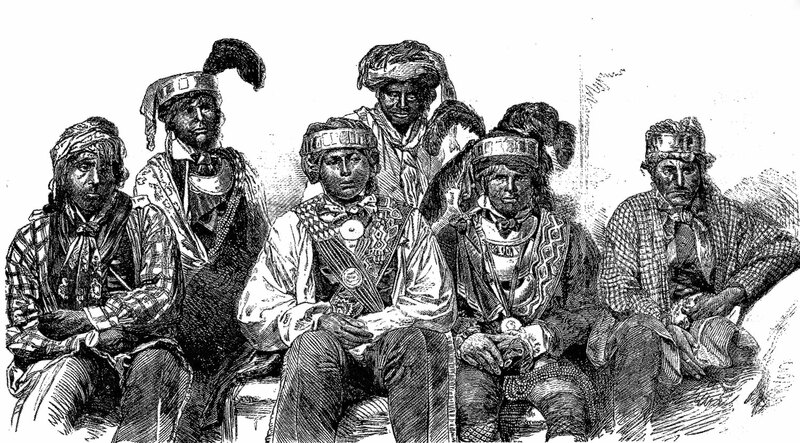 In 1818, the Seminoles were joined by Red Stick Creek warriors during a series of border raids as far north as present day Georgia. In response, the United States directed war hero Andrew Jackson to put down the conflict. As usual, Jackson was the aggressor. Jackson led a force of 800 U.S. Army regulars, 1000 Tennessee volunteers, 1,000 Georgia militia and 1,400 Creek Indians. He and his force attacked both Seminole strongholds and Spanish outposts. His aggressiveness and the size of his army is believed to be the reason why Spain became so eager to sell Florida. They simply didn't believe that they could stop him from taking it, so they sold the territory cheaply. In 1829, Andrew Jackson was elected President of the United States. Shortly afterward, he signed the Indian Relocation Act of 1830. The law required that all Native Americans be relocated east of the Mississippi River. At the time, the Seminole agreed to the Treaty of Payne's Landing. Under the treaty they were required to move to the new Indian Territory in Oklahoma, but by mid-point in Jackson's second term they were still in Florida. At the same time, a new leader had risen among the Seminole ranks. His name was Billy Powell. Billy was the son of a British trader and a Creek Indian woman named Polly Copinger. As he grew older he took the name Osceola. Osceola and his men began systematic raiding of the surrounding Euro-American settlements. Major Francis Dale was assigned the task of apprehending Osceola and his men. North of Tampa Bay, Dale led his men into an ambush on December 28, 1835. They were swarmed by almost 200 Seminole warriors, and over 100 infantry soldiers were killed, including Dale himself. Then, just a few days latter Osceola and his warriors attacked 500 Florida militiamen and 250 U.S. Army infantrymen on the banks of the Withlacoochee River. Again the Seminole were victorious, but this time Osceola was seriously injured. For the next two years the Seminoles fought guerrilla warfare. They knew that they could not defeat the U.S. Army on the open battleground. Then in October of 1837, Osceola traveled under a white flag to Fort Peyton, Florida for peace talks. He was subsequently captured and incarcerated at Fort Moultrie, South Carolina. Osceola had been fighting malaria for a long time, and his condition deteriorated quickly in jail. He died at the age of thirty-three. In 1837, General Zachary Taylor took over command of the troops. He utilized continuous search and destroy missions to break the Seminole. Finally, he forced them to fight out in the open. The battle occurred at Lake Okeechobee, in December of 1837. Here Taylor defeated the Seminole, and once again they returned to guerrilla warfare. Then, in 1841, after more than 1,500 troops had been killed, General William Worth defeated the Seminole by using a scorched earth policy, and in the process he destroyed all of the Seminole villages and crops. Most of the Seminole had been relocated to the Indian Territory in Oklahoma by 1842.